For the past 13 years, I have been traveling for work. In that time, I have become increasingly less tolerant of poor traveling etiquette. There are some general rules, albeit some of them unspoken, that ALL passengers should have to commit to memory before they jump on their next flight. Nowadays, there are very few people that have never flown. However, if you happen to be an airline virgin, this should only serve as a study guide before you book that inaugural flight. For those of you that have flown at least once in the past 12 years, none of this should come as a surprise to you. If it does, I dedicate this blog to you. Every domestic flight has the same rule. 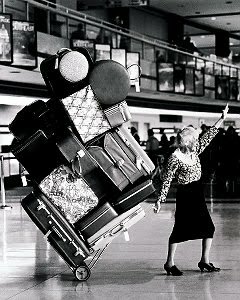 . . you are allowed a TOTAL of two carry on bags. Not two and a purse, not two and a backpack, not even two and a guitar. TWO. If you have two bags, one is really supposed to go beneath the seat in front of you, and one above. Honestly if it's small enough, even if you are only carrying one bag it should live by your feet. Anything else is just stingy. When your seat assignment is 27B, your bags belong at or near your row. . . NOT above bulkhead. Maybe you don't realize it, but passengers seated in bulkhead are required to put their bags there, as there is not a seat in front of them. Oh, and if you DO realize that and just don't care . . . your boarding pass should be revoked. Speaking of boarding passes. . . with very few exceptions, your boarding pass shows a zone number. This zone number tells you when you should be boarding. If your zone has not been called, SIT DOWN. This isn't Southwest after all. Unless it is, and then it's usually a free-for-all. Should you happen to be lucky enough to avoid a middle seat assignment, throw that poor guy a bone. He has no leg room and is already feeling claustrophobic. 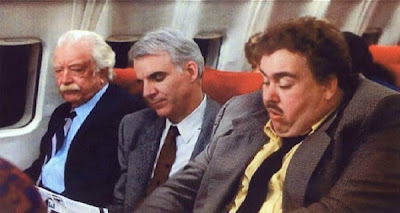 . . would it kill you to allow him to have the arm rest? Don't kick a guy when he's down, people. This one SHOULD go without saying. 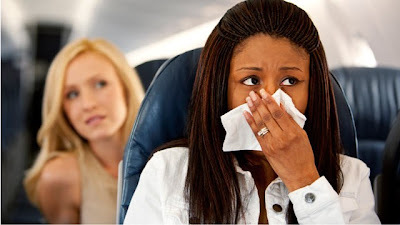 If you are sick and coughing or sneezing, PLEASE cover your mouth completely. It is bad enough that we are all breathing recycled air, but to add the Ebola virus to the mix for no good reason is just stupid. Stop being gross. Now this one is a bit personal. It goes by many names, so please feel free to insert whichever name speaks to you . . . "air biscuit, toot, break wind, shart, cut the cheese, who stepped on a duck, pass gass, let one rip, crop dust, and of course, fart." None of these are acceptable to do on a plane, and YES, we know it's you. You should be ashamed of yourself. You are disgusting. Hey window seat guy. . . If you have to get up to use the bathroom, I would be THRILLED to get out of your way. Maybe it's just a personal space issue, but I do not wish to have you straddle me in order to avoid being a bother. I would prefer to be woken up instead of having a surprise lap dance. ICK! If you happen to notice that someone is reading, sleeping, wearing sunglasses or listening to headphones . . . PLEASE do not attempt to strike up a "So is Topeka home to you?" conversation. There are certain social cues that should stand out to you in this scenario. Body language is key. When the plane lands, I know it's hard to contain yourself, but stay seated until you hear that "DING". Don't worry, the flight attendants will remind you. Now comes the really tricky part. . . If you are seated in row 17, there are 16 rows that will be exiting before it is your turn. This bears repeating. WAIT YOUR TURN. I will absolutely trip you on purpose if you try to run me down in the aisle. If this is hard to remember, think back to that grade school song "No Cuts, No Butts, No Coconuts." Waiting your turn should not be confused with letting everyone and their mothers deplane before you get out of my way. I should clarify. If you happen to be the poor unfortunate soul that was forced to put your bag 12 rows back because of scenario #2 above, you should not share your misfortune with the other passengers in your row. I am not suggesting that you attempt to channel the soul of a salmon and swim upstream to your bag. I do however request that you relocate to a more convenient area while you are waiting to retrieve your bag. It's just polite. I may be a travel snob, but I think we could all be a little more conscientious of our air travel habits. Flying for business and flying for leisure are two VERY DIFFERENT things. So there should be licenses issued to travelers once they have completed a mandatory etiquette course. It would make this world a better place . . . just sayin.